As you know, several inches of snow were supposed to arrive tonight, but now they are saying we'll be spared more snow this weekend. Saturday looks to be a bit cool and it's supposed to be in the forties Sunday, so let's do an afternoon ride Sunday. That way you can ride indoors Saturday morning and be ready for another ride Sunday. We will meet at Starbucks at 1:00 PM Sunday. 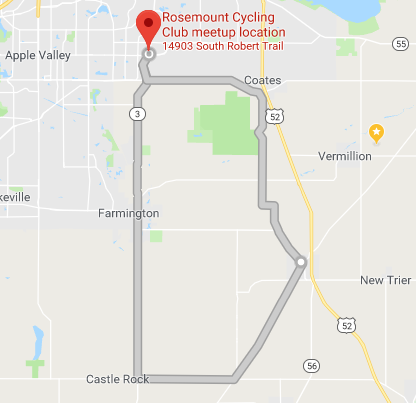 The wind is expected to be from the southeast, so we'll ride a new route south to Castle Rock, northeast to Hampton, and back to Rosemount for 37 miles. That should give us a nice tail wind all the way back from Hampton. I saw several RCC riders at GP's party Tuesday, and picked up some swag from the vendors. We enjoyed some free beer and food and swapped cycling stories.